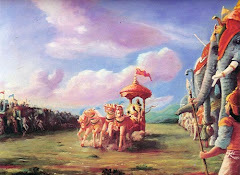 "This picture, a small picture, whatever you can, like this Chaitanya Mahaprabhu's picture. And offer Him little fruits, and little flower, and little insence, and chant, and dance, and never mind ... what is your condition. 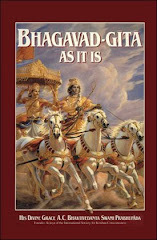 Everything will come later on." 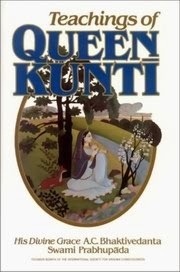 as told by Gurudas Prabhu, Shyamsundar Prabhu and Malati Mataji. Recorded on March 18, 1967 in San Francisco, CA. 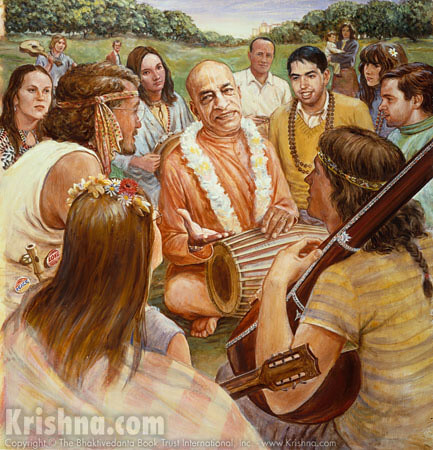 This is arguably the most famous Hare Krsna rock poster of all time, "Krishna Consciousness Comes West - Mantra Rock Dance". 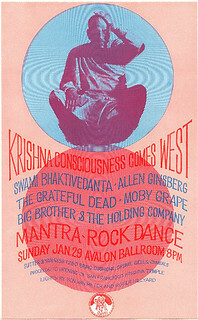 This concert took place on January 29, 1967 at the Avalon Ballroom on Sutter at Van Ness in San Francisco. 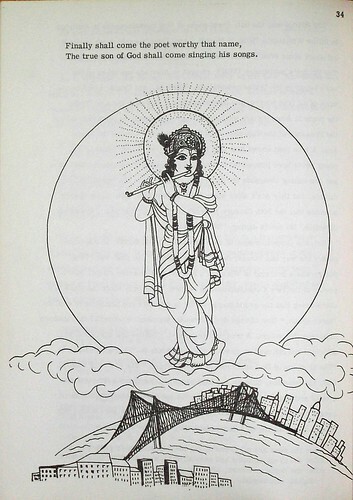 The show was a fundraiser for the San Francisco temple. The Avalon hall was donated for the fundraiser that night by The Family Dog, who ran the venue and promoted hundreds of now legendary rock concerts there. 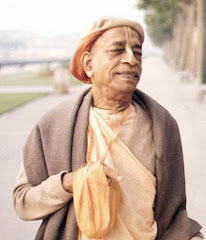 Srila Prabhupada was joined by the Grateful Dead, Janis Joplin and her Big Brother band, Moby Grape and Allen Ginsberg. 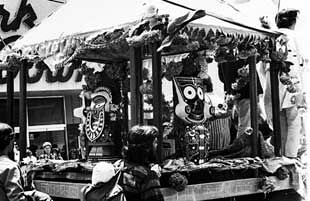 The Rathayatra Festival of India, a sacred celebration in worship of the Supreme Lord, Krishna, will be enacted Sunday, July 9, for the first time in the western world. 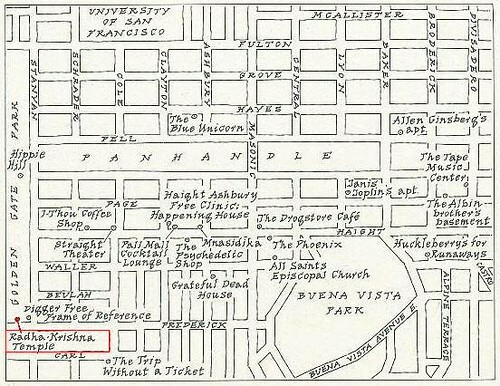 People and cars meet at 1 p.m. at corner of Haight and Lyon to form a processional to the sea. There will be 8 days of festivities, chanting, dancing and feasting on ocean beach. All are welcome to this joyous event! 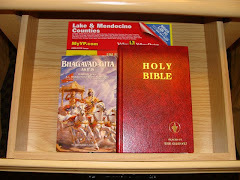 In Vol.1, No. 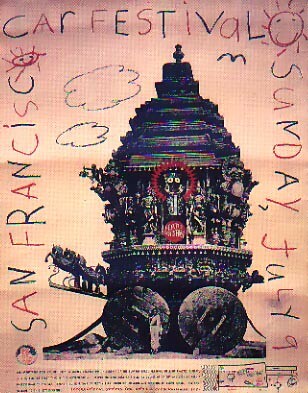 2, 1967, of The Maverick, had a multi-page article entitled "Welcome To San Francisco", written as a survival guide for all the hippies arriving for the Summer of Love. 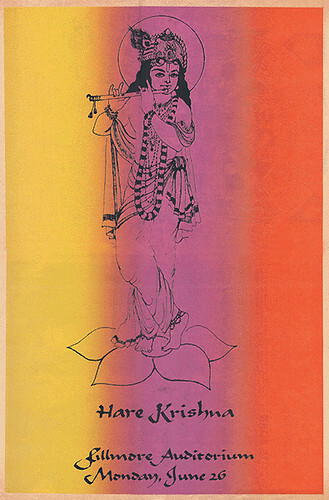 Included in this issue a brilliant, rainbow hued Lord Krsna, advertising Hare Krishna at the Fillmore Auditorium on Monday, June 26, 1967.